South Shields maintained their excellent form as they came from behind to beat Whitby Town 5-2 on an entertaining afternoon at Mariners Park. Shields fell behind early on but hit back almost immediately thanks to a superb strike from David Foley. They then hit the front after visiting defender Jassem Sukar was sent off for a last-man challenge and Robert Briggs converted the resulting penalty. Whitby battled well with 10 men and, after Foley had doubled his account for the afternoon, they got back into it thanks to a goal by substitute Matty Tymon. The Mariners ultimately proved to have too much for the Yorkshiremen, and late goals from Dillon Morse and Blair Adams ensured they stayed top of the league. They could not have got off to a much worse start, though. Whitby pressed the hosts in the early exchanges and were rewarded when striker Ashley Coffey stole the ball high up the pitch and rattled in a 20 yard effort via the post. There were just three minutes on the clock and the boisterous away support must have believed their team had a chance of halting Shields’ 19-match winning run at home in the league. However, the response from Shields was instant as they began to dominate possession and carve the visiting backline open. They were almost level within a minute of falling behind as Craig Baxter advanced through the middle and forced former Mariners goalkeeper Jack Norton into a smart low save. Norton was to be in the thick of the action throughout the 90 minutes. Shields threatened an equaliser on a number of occasions as they marched into decent attacking positions before they did draw level in the 10th minute. Lee Mason played a tremendous ball out to Foley on the left channel and he went on the outside of his marker before rifling a left-foot effort into the roof of the net. Josh Gillies almost put Shields ahead when Gary Brown slipped the ball through to him on the inside-right of the box, but a superb block denied him. Whitby, despite being second-best, did possess a threat and fired Shields a double warning when a Coffey shot was deflected wide before Callum Patton produced some impressive footwork before seeing his effort deflected over. The game then swung decisively in the home side’s favour when a superb ball from near the halfway line on the left by Gillies found Foley and he was pushed over by Sukar in the area. The Whitby left-back was given his marching orders and Shields had a golden opportunity to hit the front. Briggs did not pass it up as he found the corner of the net, sending Norton the wrong way from the spot. Norton kept the deficit at one as he beat away a low drive by Gillies before Shields were forced into a reshuffle when captain Jon Shaw was withdrawn with a groin injury. Phil Turnbull replaced him and slotted into midfield, with Baxter shifted to right-back and Brown to the centre of defence. The Mariners carried their one-goal lead into half-time and came out of the blocks sharply in the second half as they aimed to put the game to bed. Mason dragged an effort wide from the edge of the box before Shields did go 3-1 ahead after a flowing move. Turnbull split the Whitby defence open as he played in Adams on the left of the box and his teasing low delivery was rolled home by Foley from close range. Norton did well to keep the visitors in it, saving from Adams, Briggs and Gillies before making an even more impressive stop, keeping out a Gillies shot from point-blank range. Shields were peppering the Whitby goal but Norton refused to go down without a fight as he made further saves from Foley, Gillies and substitute Gavin Cogdon. Chris Hardy’s side then responded, though, and Liam Connell had to be alert to tip a piledriver from Dale Hopson over the bar. He was beaten from the resulting Hopson corner as substitute Tymon met it at the near post and sent the ball into the bottom corner. Suddenly, it was game on again and Whitby perhaps should have levelled when another Hopson corner found Tymon in the six-yard area, but he fired over. Shields gradually regained their dominance, but continued to be frustrated by Norton. He closed down the angle well to keep out one Baxter shot, made a tremendous close-range save from Nathan Lowe and palmed a Cogdon effort wide just as the Shields striker appeared certain to make the points safe. Eventually, the win was sealed for Shields when a Cogdon header came back off the bar and Briggs diverted the ball across the area to Morse, who hooked it past Norton for his eighth goal of the season. There was to be a cruel final blow for Norton as Foley played in Adams on the inside-left of the box with a minute remaining and his shot squirmed under the body of the goalkeeper as the Mariners added a fifth. Shields’ victory means they have now won their last 20 home matches in the league, a run which stretches back to last February. They are back in action next Saturday when they travel to Mickleover Sports in the league. 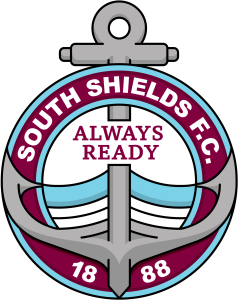 SOUTH SHIELDS: Connell, Brown (Lough 76), Adams, Shaw (c) (Turnbull 42), Morse, Briggs, Baxter, Lowe, Mason (Cogdon 66), Gillies, Foley. Subs not used: Mouanda, Harmison. Goals: Foley (10, 51), Briggs (pen 25), Morse (87), Adams (89).